There is no other place which evokes the ancient past of an island the way Cueva Pintada does. 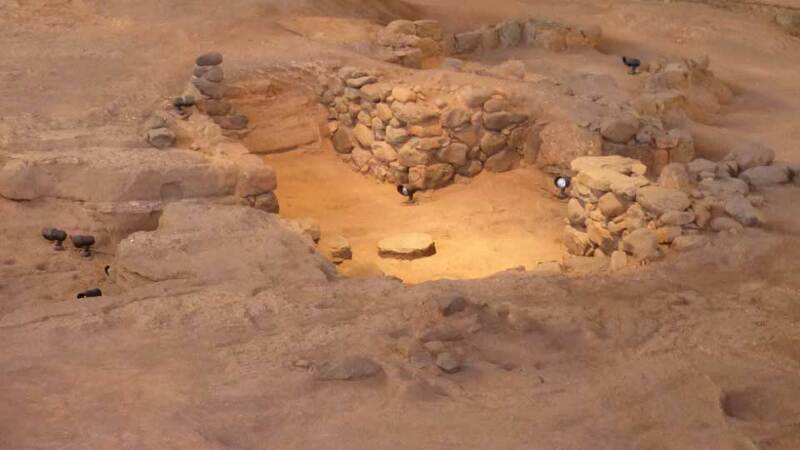 The famous museum and archaeological site in Gran Canaria lets visitors experience a sensory-filled blast from the past. Take a step in the painted caves which for centuries have held the memories of the Guanches, the ancient inhabitants of the island. Find out why this is revered as one of the most important historical spots in the Canaries. The Painted Cave Archaeological Museum and Park is situated in Galdar, a municipality in the northwest of Gran Canaria. Galdar is held with great importance as it once was the capital of the island and where the King ruled in Pre-Hispanic times. However, it wasn’t until recently that the site was unveiled. It all started in 1862 when a farmer accidentally discovered the cave while picking pears. Since then, excavations have been organized which gradually revealed an entire ancient village. Efforts to protect and preserve the unearthed relics and dwellings were in full swing in the 1970s. The diggings took about 20 years to complete before the museum was built. Up to this day, archaeologists are still discovering and learning about the intriguing Painted Caves in Galdar. Since its discovery, it has continuously welcomed thousands of curious visitors every year. More than a treasure for archaeology, it’s a living testament to Gran Canaria’s beautiful and rich culture before its colonization. Once in town, don’t expect to see only a small museum-like building. La Cueva Pintada de Galdar is a huge site, to say the least. Each corner paints a clear picture of the ancestral heritage of the island’s aborigines. The largest archaeological site in the island is composed mainly of the ruins of an old aboriginal village which stretches for a couple of blocks. Entering modern elevators, and walking through constructed catwalks, visitors get a bird’s eye-view of the vastness of the village. Almost half of the site is quadrangular dwelling places with packed soil or stone flooring, some of which are red colored. The houses are kept inside annular walls. Pieces of furniture, like tables, are carved from stones. Set in the middle and just a little below the cave homes is the renowned Painted Caves of Galdar. It is believed to be a place of worship among its ancient inhabitants. Marvel at the walls intricately painted with red, white, and black geometric figures which archaeologist theorized could be a calendar. To protect the place, glass walls were built, and taking photos in this “Sistine Chapel of the Canaries” is prohibited. Most of the museum displays are the little everyday things used by cave dwellers in the past. It isn’t hard to appreciate the beauty of their culture after seeing the relics. The simplicity of their lives is visualized in the many hand-made and decorated pottery, utensils, swords, needles, knives, and even coins. Visitors get a deeper understanding of their beliefs after going over several statues of human and animal figures made with clay. The painted and decorated pots found on the site are not found anywhere else in the Canaries. Part of the tour around the state-of-the-art museum is a 3D movie. The audiovisual presentation highlights the life of the Guanches, the original inhabitants of the island. While watching, take part in reliving the memories of their dreams, hopes, fears, and courage. Discover how they shone in their finest hour, exhibiting bravery amidst war and defeat. Overall, the film plays an essential role in making the museum experience simply unforgettable. The island of Gran Canaria is famous for its beaches, natural parks, and its rich culture. After spending time at sea and the sand, head over to culturally rich attractions scattered around the island, such as the Painted Caves in Galdar. Not too far from the town square, Cueva Pintada provides visitors with an interesting background to Gran Canaria and the whole Canary Islands. It is a historical, archaeological, art, and scientific discovery no one should miss. The modern museum gives a lovely lens by which one could see the island’s colorful past. Aside from being esteemed as the most important archaeological discovery in the island, those who have a penchant for primitive art find its painted walls truly mesmerizing. Some people join the guided tour which is conducted in several languages, even as others wander on their own. No matter how they experience it, thousands of tourists make this visit a part of their travel checklist when in Gran Canaria. The Painted Cave, located at the center of Galdar, is only 27 kilometers west of Las Palmas. One only needs to pass through GC-2 motorway and drive for roughly 20-30 minutes. It’s also only 50 kilometers from the airport, and anyone could take a taxi passing the same highway to the cave. If public transport is the choice, then head to San Telmo Station and take bus No. 103 or 105 on Platform 6. Bus 103 leaves every hour while Bus 105 leaves every 20 or 40 minutes. Once in town, just head to the town center in and the famous site in Calle Audiencia 2 is hard to miss. La Cueva Pintada de Galdar is open on Tuesdays to Saturdays from 9:00 to 17:00, and on Sundays from 10:00 to 18:00. The entrance fee for adults is €6, while those below 18 years old can explore the museum for free. Preserving ancient sites like Cueva Pintada is like preserving the heritage of a whole civilization. The relics, the ruins, and the walls of this site have witnessed centuries of lives weaved through time. It bears the customs, beliefs, and traditions of the admirable indigenous people of the Canaries. So, dust off the sand from the beaches of Gran Canaria and learn more about the people who built the beautiful island’s rich antiquity.